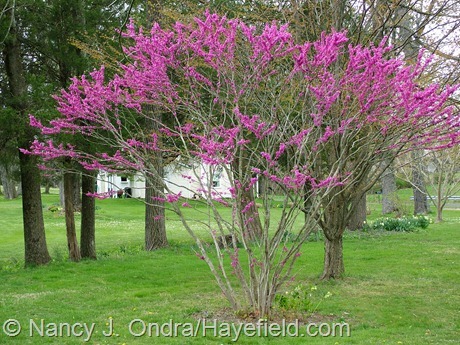 …and the flowering dogwoods and redbud (below is Cercis yunnanensis) normally aren’t out until early May. 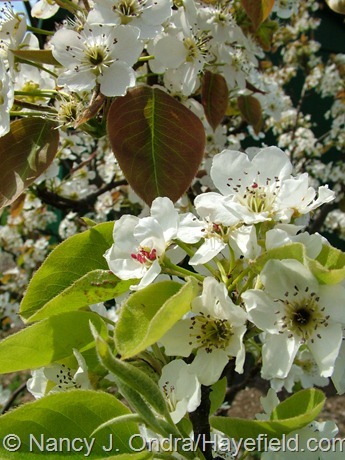 The multi-variety Asian pear has been loaded with bloom, but I have a bad feeling that the flowers have been too damaged by the cold to set much, if any, fruit. 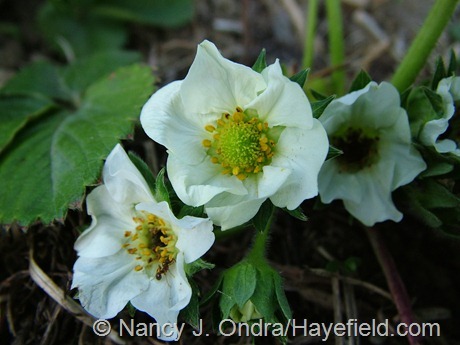 Both the regular and alpine strawberries started flowering in early April. 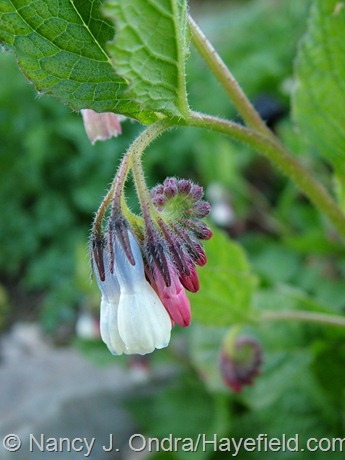 It’s easy to tell which blooms got frost-damaged by the dark centers. There are lots of fresh new flowers coming along, though. 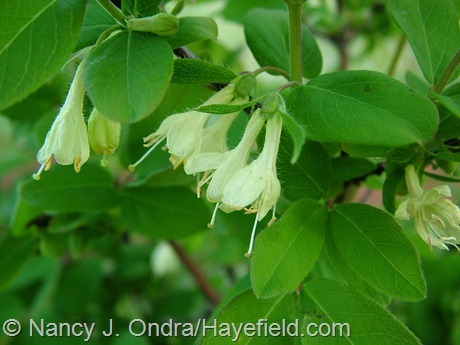 The honeyberries (Lonicera caerulea var. edulis) have been blooming well, fortunately, and they don’t seem to have been bothered by the cold, so maybe I’ll get to harvest some of them, at least. Above is ‘Blue Moon’; below is the much fuzzier ‘Blue Velvet’. Besides the frosty nights, we’ve also had days and days of strong wind. Considering that we’ve gotten barely 1 inch of rain in the last 6 weeks, that makes for some really dry conditions. 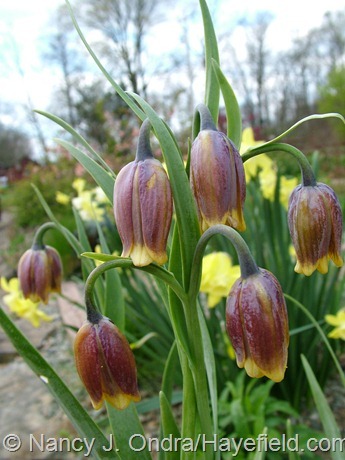 The bulbs have been lovely over the past few weeks, even if their bloom times have been rather weird. 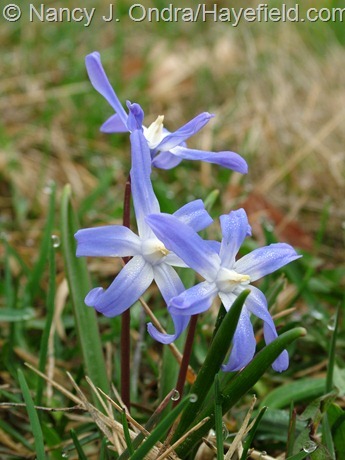 Below, naturalized glory-of-the-snow (Chionodoxa forbesii). 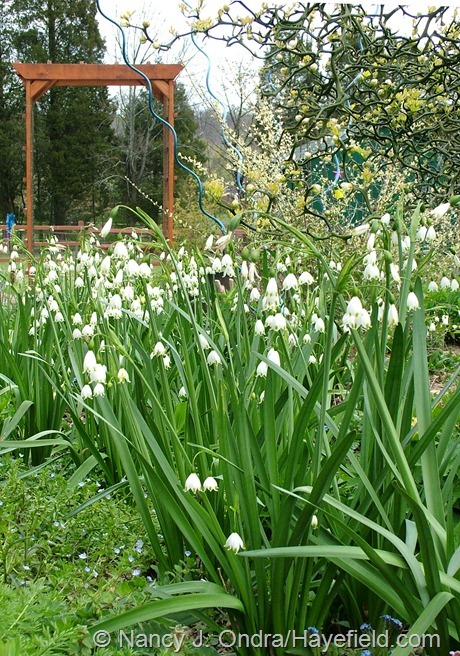 Above and below, ‘Gravetye Giant’ summer snowflake (Leucojum aestivum). These have been fantastic this year, in bloom for nearly a month now. 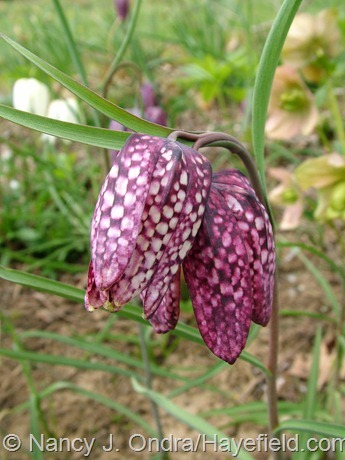 A couple of fritillaries: above, fox’s grape (Fritillaria uva-vulpis) and below, checkered lily or guinea hen lily (F. meleagris). A few tulips are finally coming along, too. 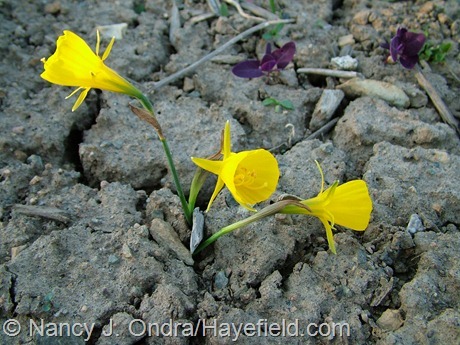 Above, the elegant Tulipa whittallii. 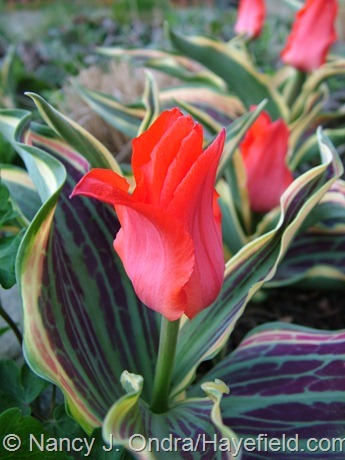 Below, the super-gaudy, variegated ‘Fire of Love’. 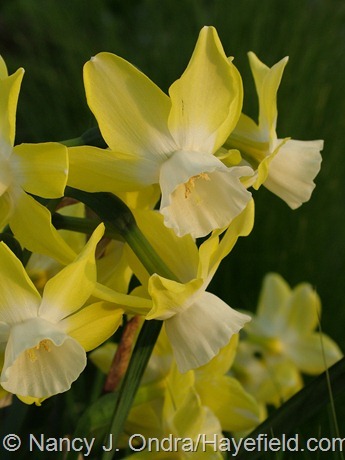 And one long-lasting daffodil, Narcissus ‘Pipit’. 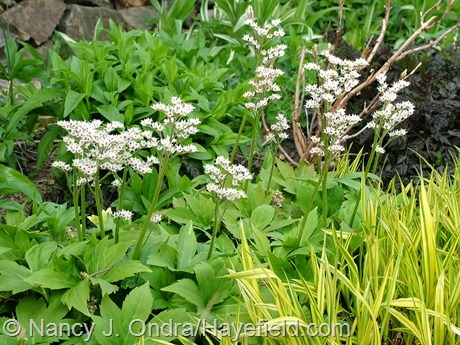 Some early perennials are also gracing the garden and grassy areas. 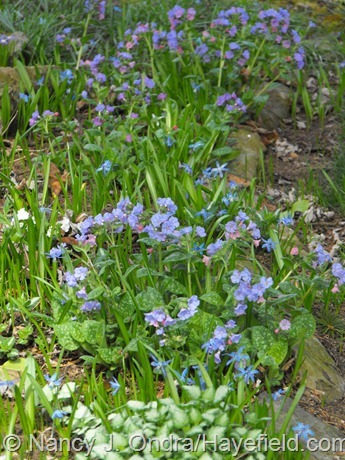 Above, one of many lingering Lenten roses (Helleborus x hybridus); below, self-sown lungwort (Pulmonaria saccharata) mingling with glory-of-the-snow (Chionodoxa forbesii). 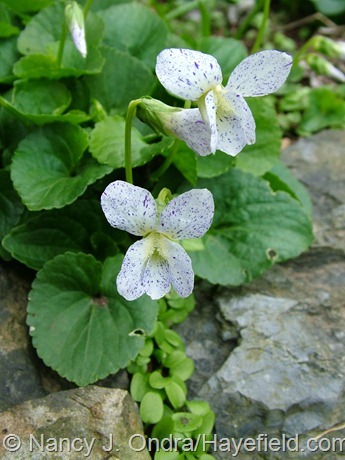 Above, Allegheny pachysandra (Pachysandra procumbens); below, ‘Freckles’ violet (Viola sororia). 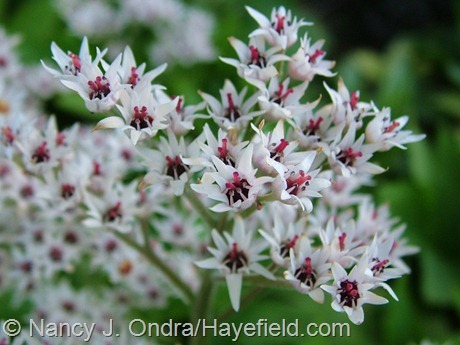 Above, Mukdenia (formerly Aceriphyllum) rossii; below, a closeup of its starry flowers. 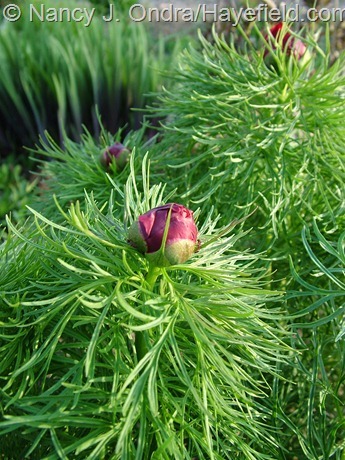 Buds in the beds: above, ‘Purple Smoke’ false indigo (Baptisia australis) and below, fern-leaved peony (Paeonia tenuifolia). 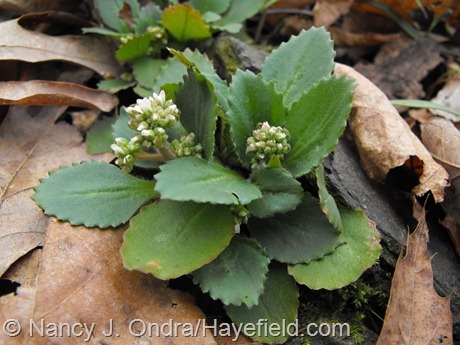 Above, dwarf comfrey (Symphytum grandiflorum); below, early saxifrage (Saxifraga virginiensis). 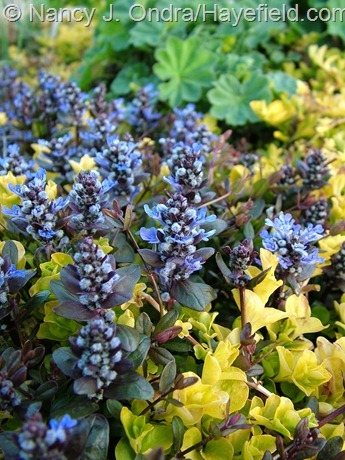 Above, spring beauty (Claytonia virginica); below, Chocolate Chip ajuga (Ajuga reptans ‘Valfredda’) mingling with golden creeping Jenny (Lysimachia nummularia ‘Aurea’). 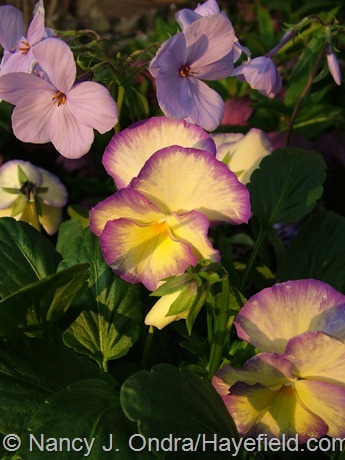 Above, Viola ‘Etain’ with ‘Blue Ridge’ creeping phlox (Phlox stolonifera). Below, one of my new favorite silly things, grown from seed (from Plant World Seeds) and finally flowering this year: a sort-of-pink dandelion (Taraxacum pseudoroseum). 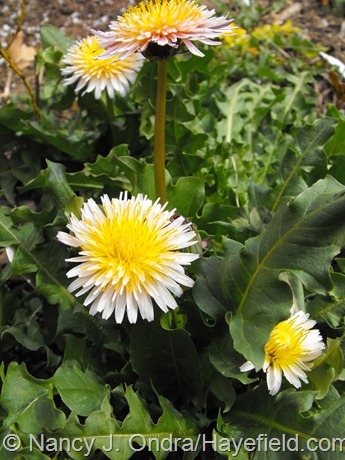 I also started seeds of the variegated dandelion ‘White Flash’ (T. officinale), also from Plant World Seeds [below]. It’s kind of amusing but neither white nor especially flashy. 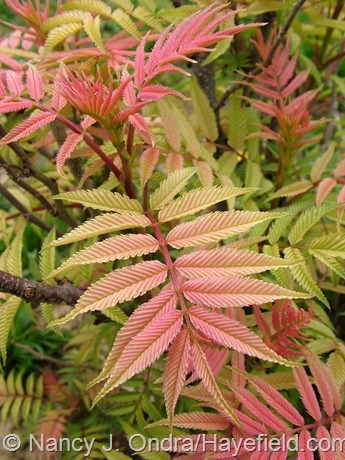 Speaking of foliage, here’s a gallery of some lovely leaves as an early entry for tomorrow’s Foliage Follow-Up at Digging. 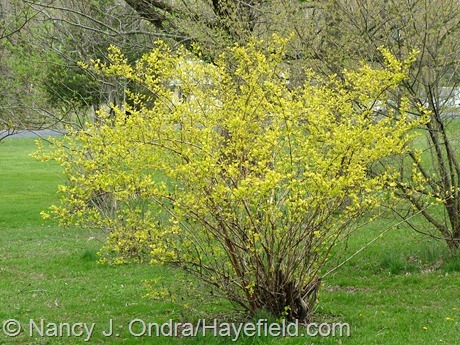 Above, looking quite like a forsythia, is the emerging new growth of ‘Dart’s Gold’ ninebark (Physocarpus opulifolius). 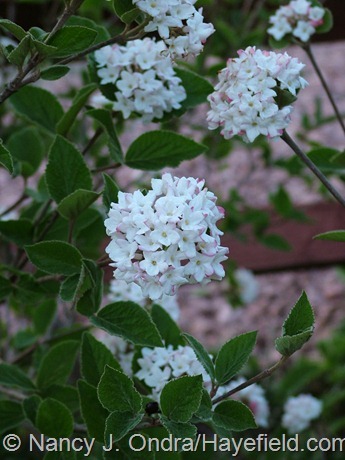 Below, ‘Sem’ Ural false spirea (Sorbaria sorbifolia). 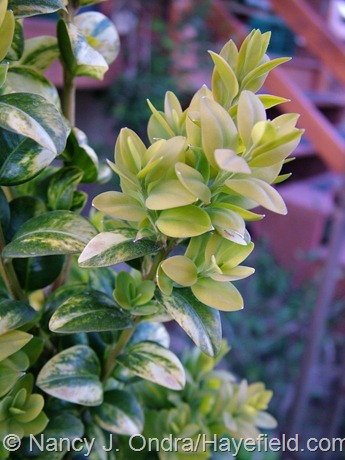 It’s having some trouble getting established here, but the spring foliage of this shrub is outstanding even when the plant is small. 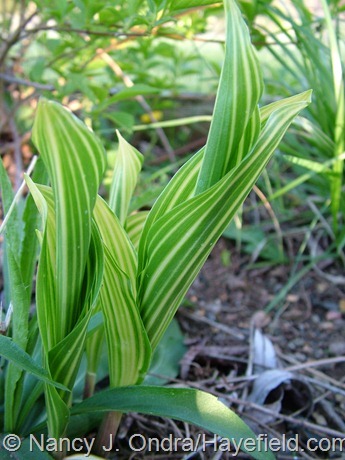 Above, ‘Gerald Darby’ iris (Iris x robusta); below, variegated lily-of-the-valley (Convallaria majalis ‘Variegata’; it used to be ‘Striata’ or ‘Aureostriata’, I think). 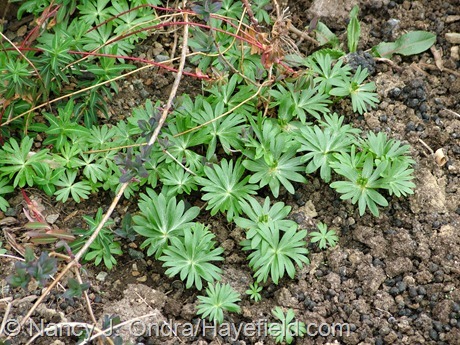 Above, winter aconite (Eranthis hyemalis) after bloom; below, ‘Espresso’ wild cranesbill (Geranium maculatum), not flowering yet. 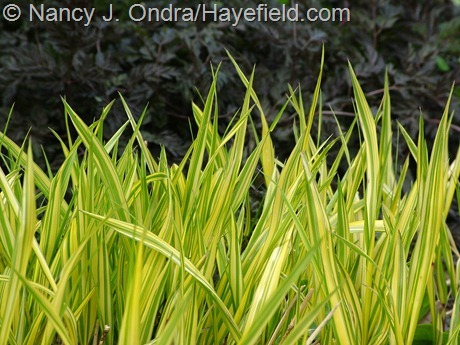 Above, golden Hakone grass (Hakonechloa macra ‘Aureola’) against ‘Ravenswing’ wild chervil (Anthriscus sylvestris). Below, bloody dock (Rumex sanguineus). Above, a seedling from ‘Dark Towers’ beardtongue (Penstemon). ‘Dark Towers’ is supposedly sterile but has somehow managed to produce dozens of seedlings anyway. 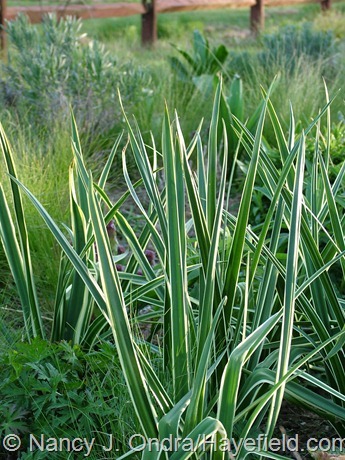 Above, ‘Sacajawea’ camassia (Camassia leichtlinii); below, shredded umbrella plant (Syneilesis aconitifolia). 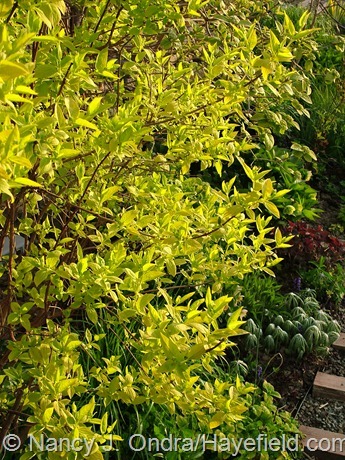 Above, ‘Latifolia Maculata’ boxwood (Buxus sempervirens); below, golden mockorange (Philadelphus coronarius ‘Aureus’). 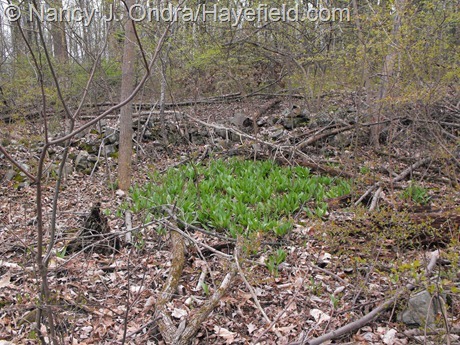 This is also the time of year Mom and I make a special trip into her woods to harvest ramps (Allium tricoccum). 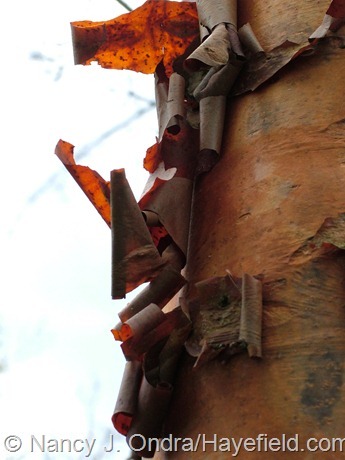 And, ok, these are neither flowers nor foliage, but some shots of beautiful bark. 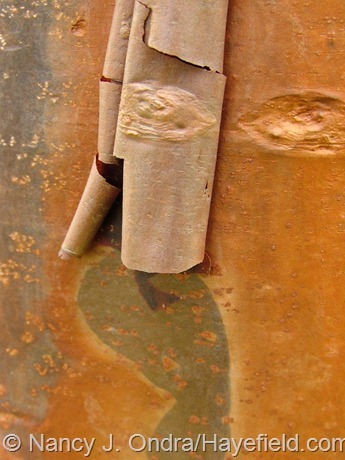 Above and below are from a paperbark maple (Acer griseum). 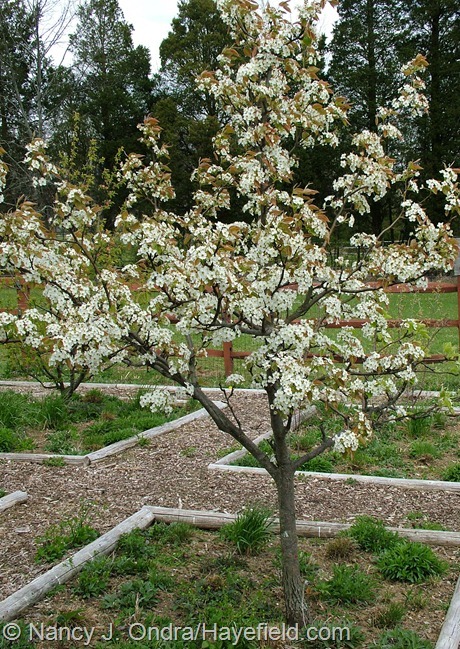 It was one of the first trees I planted at my parents’ farm (I think that’s about 26 years ago now). 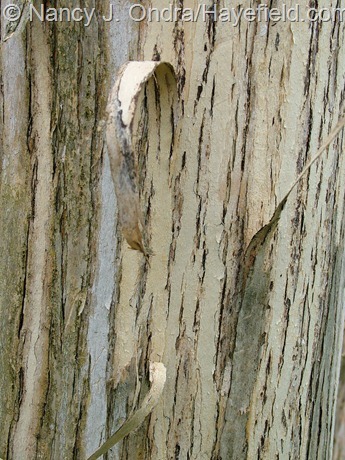 These two are the bark of a seven-sons tree (Heptacodium miconioides). This tree’s about 24 years old. 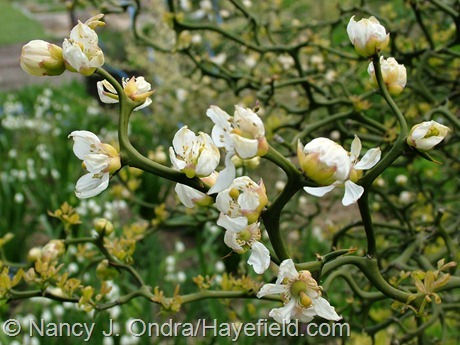 Now, to see what’s up in other gardens around the world, check out the links in Carol’s main Garden Bloggers’ Bloom Day post at May Dreams Gardens. Those honeyberries look interesting, are they tasty? Don’t think I’ve ever had them. As usual, fabulous photos, you can even make a plain stand of iris look poetic. I’ve heard that about ‘Sem’ and gave it *plenty* of space (it’s out in The Shrubbery, at least 8 feet away from its nearest neighbor), but it’s still barely 1 foot tall and wide after 3 years. I wish it would either settle in and grow or just die already, instead of sitting there being indecisive. Yes, the honeyberries are pretty tasty, though I’ve had only a few; the birds seem to get them before I remember to check the ripening. I’ve had rotten luck with blueberries, so these are probably the closest I’ll ever get. The plants are nice-looking, too. Hope you have a great Bloom Day, Brenda! Lovely lovely lovely! 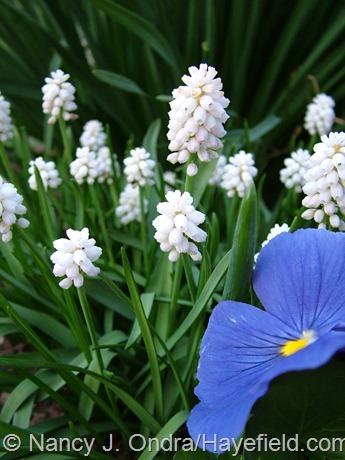 Your gorgeous garden is springing into life. 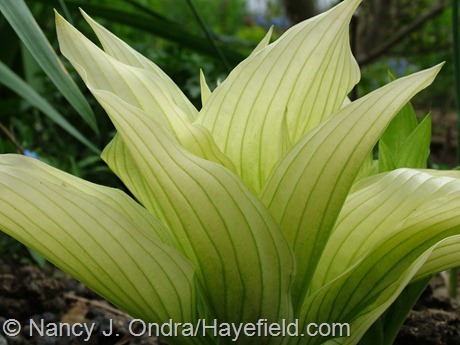 Love that crazy white hosta – how does that photosynthesize?! Hey there, Kerry. 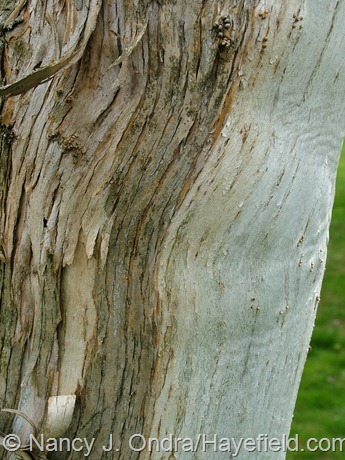 By early summer, ‘Mostly Ghostly’ turns totally ugly: kind of a sickly pale green with somewhat darker green veins. 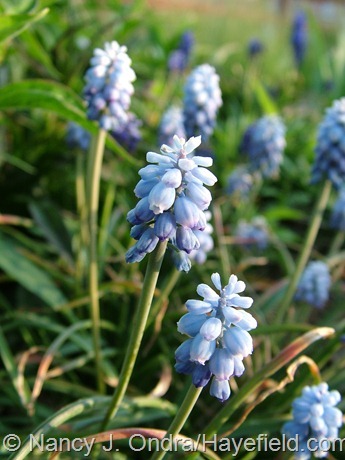 Still, it’s so fantastic in spring that I’m willing to overlook it for the rest of the growing season. Your blog always reminds me that another month have past by and that I was not so active in the garden as you were! 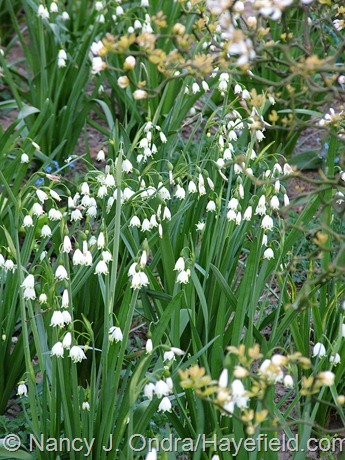 I wish I were there to see all those spring beauties. Lovely photos and plants again! I put some of my wish list. Thanks for sharing all this with us. Hi Helene! I’m sure that your spring garden is looking wonderful too. Thanks for checking in. You have an amazing garden. It was hard for me to take it all in. Thanks so much for sharing it with us. Thanks, Mary. I know I should have edited down the photos, but I’m finding these Bloom Day posts so helpful for record-keeping purposes that I lean toward including everything that I want to remember! come will be). It seems more like real spring now. I love all the gold and chartreuse. What a thoughtful idea, Chris. I’m sure that your efforts brightened the morning for many. 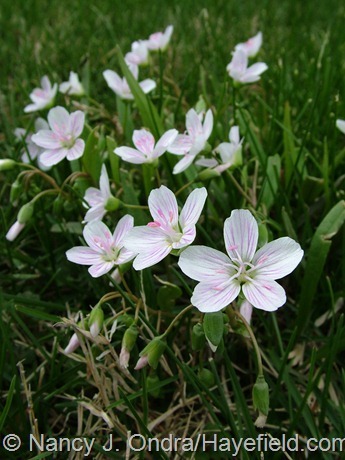 Good luck with your weeding; moist soil sure does help. Well, it was kind of an experiment, Brooke. 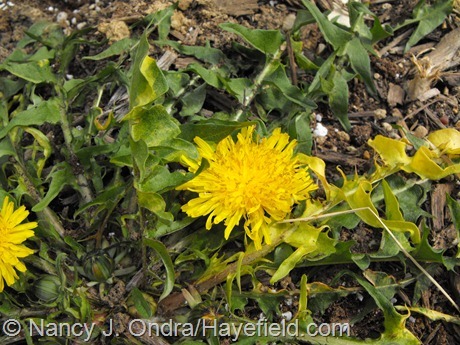 I did find out that dandelions do not take kindly to being transplanted, which I guess I should have expected because of their taproot. I promise I’ll leave a note next time I visit you! You are having a real spring. We had a summer heat wave, but then it got really cold! 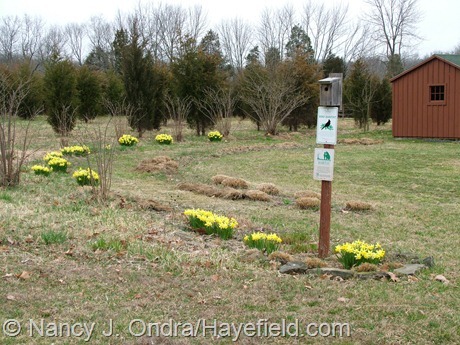 and since then we’ve had no rain, so we didn’t really gain anything – and lost some of the sugaring season. 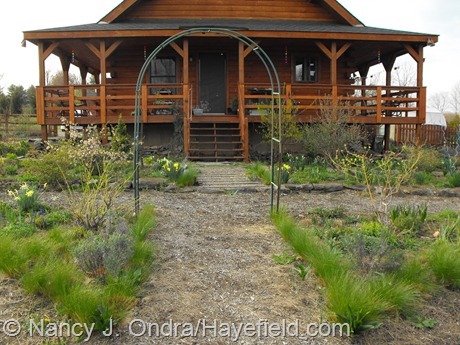 I always love visiting you and your beautiful garden – and getting so much information about your plants. I saw the neighbors had their buckets out for less than two weeks in February, Pat, so I think the season was a bust here too. I’m sorry to hear that you’re having the same drought conditions. It’s scary have warnings for extreme fire danger in April, and even some wildfires. Your photos are so lovely it is difficult to choose any favorites! 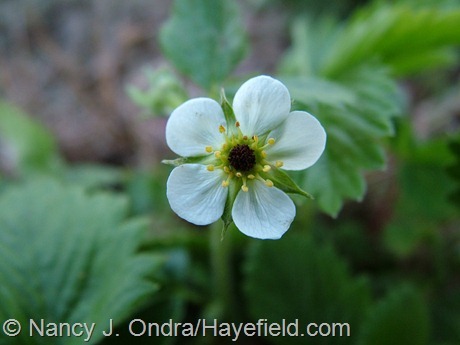 I did not know that about the dark centers on the strawberries…a good thing to learn so thank you. 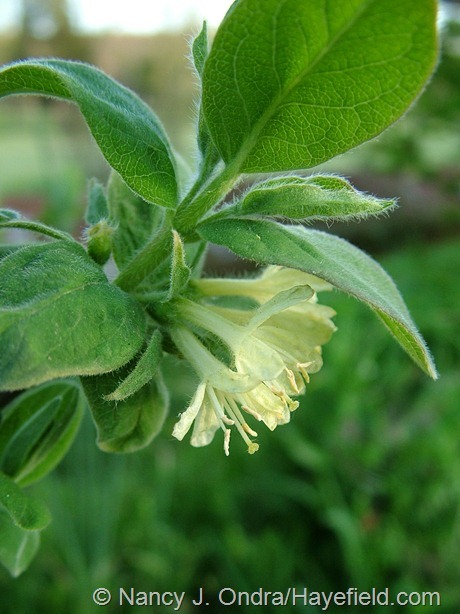 Happy Bloom Day! Thanks for visiting, Leslie! I hope you don’t have to worry about frosty strawberries. It’s usually not a big deal, since the plants produce lots of flowers anyway. We are fortunate on the west coast even though it is a much colder spring. We have had a recent downpour so all vegetation is coming up nicely. Thanks for your article. 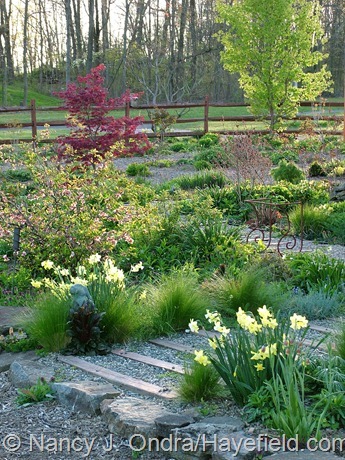 Ah, it’s just hard for us gardeners to be satisfied, isn’t it? I’d be glad to trade you our returning over-warm days for some of that rain! I must stress – DO NOT reduce your photo content!! I am not alone in saying that your interesting, informative posts are made that much better by all those beautiful, inspirational pictures. More, more I say! I also wanted to add, those fluffy leafed peonies are divine. I covet peonies badly – I’m too far north (in NZ) to grow them here. I love that stately, sublime orange species tulip too. That is very elegant indeed. 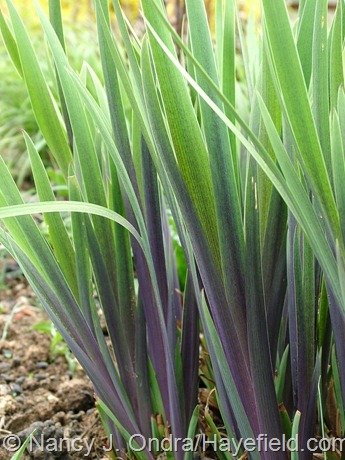 As is the dark stemmed iris. I also love that bloody dock. I have loads of ‘bloody docks’ here, if I was seen planting one (even as pretty as yours) I’d be sectioned. Let alone dandelions…! Aw, thanks, Kerry. I left out most of the woodland wildflowers and mosses, which was hard, but the post was just getting *way* out of hand. 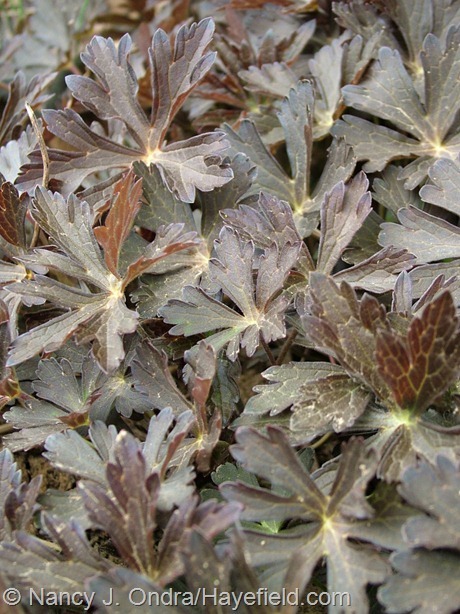 Isn’t that fern-leaved peony something? The first flower opened this afternoon, of course; a little too late for this post. It doesn’t actually bloom all that much, but the foliage is terrific. I too have lots of “bloody docks” that are not Rumex sanguineus. The hay a few years ago came with loads of curly dock seedheads, and the seeds ended up in the manure, so now the pesky things are everywhere. 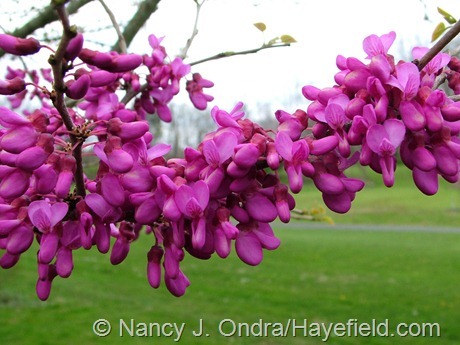 Nancy, I knew you years ago with Hardy Plant society in PA. I now live in the mountains of western North Carolina, just planted some ‘asparagus pea’ and found your blog looking for photos. The seeds i was given has to disctintly different seed shapes, so I want o know what the leaves look like when they come up. At my elevation- it might be too cool here, so we’ll see wht happens. and all of the flora and fauna of this area. Hi Robyn! Of course I remember you. I’m so glad to hear that you’re doing well. I’ve moved gardens since our old HPS days, and the bunnies have all passed on; I have two alpaca boys as companions now. 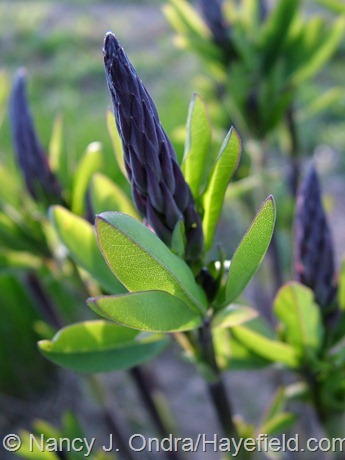 Best of luck to you with the asparagus peas. I’m kind of surprised at myself… but I rather like your “kinda pink” dandelion! (Surprised because it’s pink, not because it’s a dandelion.) The coloring reminds me a little bit of some of the softer calendulas, and I actually think its leaves are pretty, too. I always seem to learn about new plants when I visit, by the way! I’m off to find out about these honeyberries… and I should also tell you that I found your ‘Jester’ millet in seed form this year, too. I’m really excited about that one! Don’t forget to collect seed from your ‘Jester’ millet before the birds pick it all in fall; it’ll save you a fortune. I can’t imagine why the seed is so expensive. Keep them coming! Love your photos don’t change anything. I’m so excited-the black cotton seeds you were so kind to share have finally sprouted. Thank you! 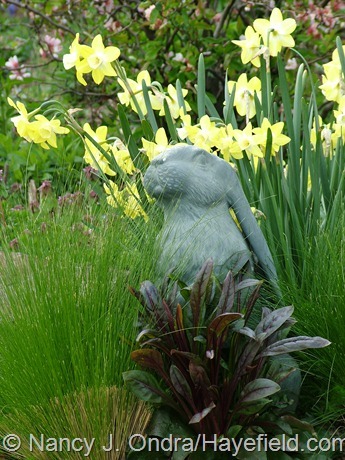 I love the composition of the bunny, daffodils, beardtongue and looks like a magnolia(?) in rear. Just beautiful. Thanks for the report on the cotton seeds, Sandi! Mine are springing up too; they sure love this warmth. I’m glad you liked that combination; so do I. The penstemon seeded into a great spot there. 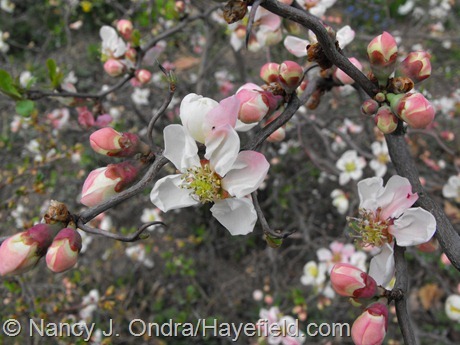 The plant behind them is the contorted flowering quince. Our spring in Tennessee has passed by as a dream in the night. It was so brief and compacted with everything blooming all at once. I hardly knew where to look for about 3 weeks. Now we are earnestly into early summer foliage expansion, somewhat slowed by the lack of rain. I started irrigating a month ago as my beds are surrounged by thirsty hackberry trees and I have learned to stay ahead of the curve. Your garden is lovely as always. 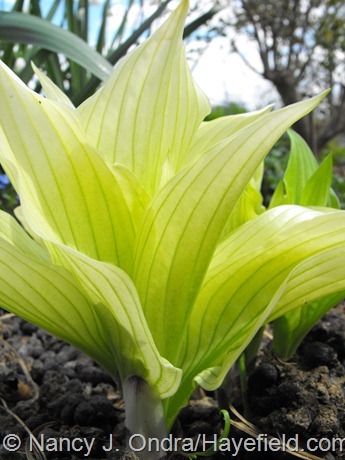 I will have to add Hosta ‘Mostly Ghostly” to my expanding collection. It puts me in mind of skunk cabbage just emerging. I vote “yes!” for the pink dandylion! It has a charm all its own! And speaking of fancy weeds, the seeds of the red plantain you sent me have germinated and are doing well. 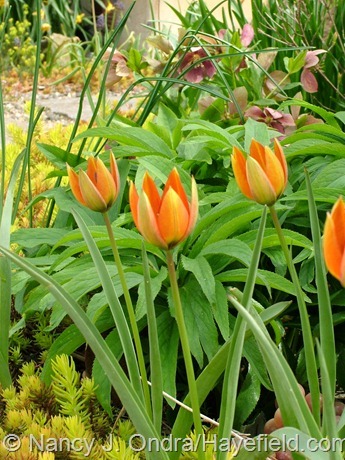 I must get the orange tulipa whitalii for next year. 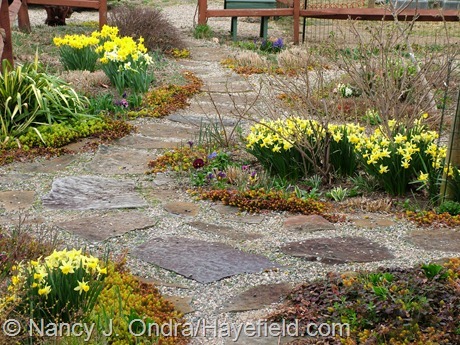 It looks wonderful with the yellow sedum. Do you know a source? Don’t cut back on the photo content, in fact, feel free to add more. I spend many happy hours studying your shots for content and composition so the more the merrier! Sorry to hear that you’re also very dry, Kate. If we have to have dry weather, I guess I’d rather have it be now; when the spring is really wet, the plants get very lush, and then they suffer during summer dry spells. This assumes that a spring drought is not followed by a summer drought, which doesn’t even bear thinking about. 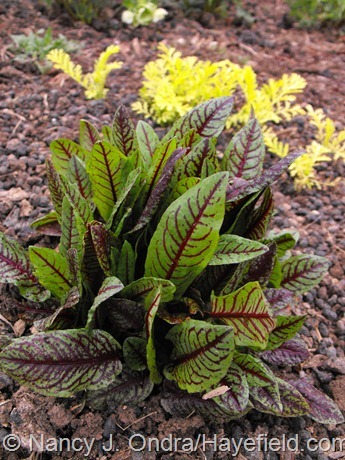 Good news about the red-leaved plantain. 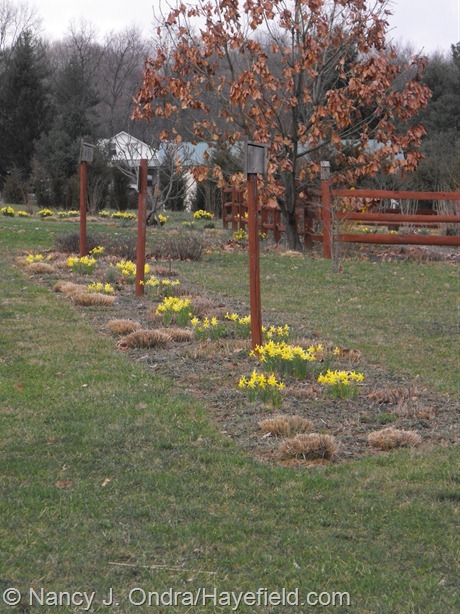 For the Tulipa whittallii, check out Brent and Becky’s Bulbs. Wow Nan, I can’t believe how far ahead of us you are out there! 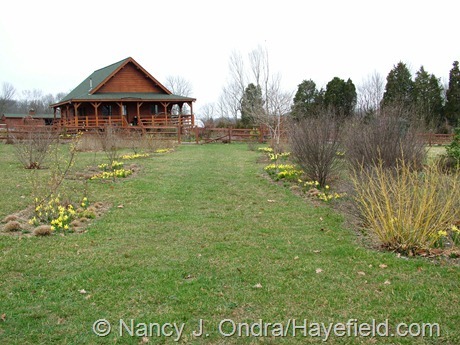 My Baptisia is just barely out of the ground and yours has buds already! 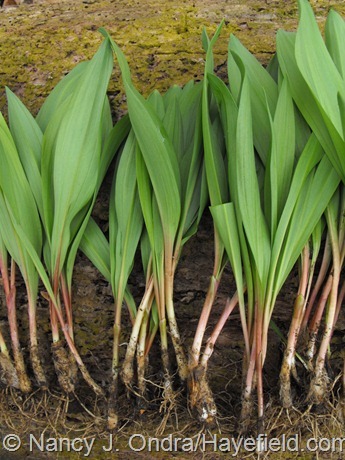 I really love that Tulipa whittallii….so charming and sophisticated. I’ve been eyeing that Mukdenia for a few years now…and somehow didn’t even realize it bloomed. 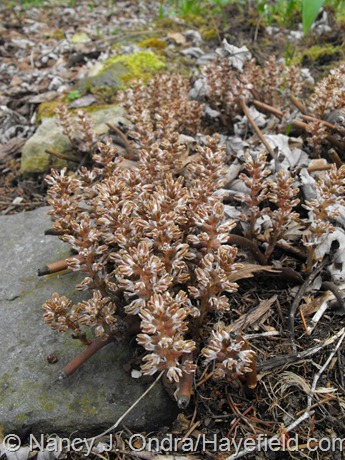 I just got some Syneilesis at a local plant sale and am so excited…I hope it forms a little colony eventually as well. ‘Mostly Ghostly’ is kind of amazing…can’t believe I’ve never heard of it before. Let’s hope all of our weather normalizes soon…who knows what we are in for this summer. Would you believe it reached 90 here on Monday – the warmest it’s been since last August? No wonder the plants are confused! Good luck with your Syneilesis. I always surprises me that my patches in sun and dryish soil are so happy, because I keep wanting to put it in kind-of-moist shade, due to it looking so much like a May apple (Podophyllum). Happy Bloom Day, Scott! I don’t mind at all, Dee; thanks for asking. I wonder why it (and some other pins from Hayefield) show up at http://pinterest.com/source/hayefield.files.wordpress.com/, while most show up at http://pinterest.com/source/hayefield.com/. Just one of those quirky things, I guess. Nan, as always, your garden is absolutely stunning! I adore that speckled violet! We are six weeks ahead of schedule in our garden which caused a problem with our magnolia but thankfully, nothing else. 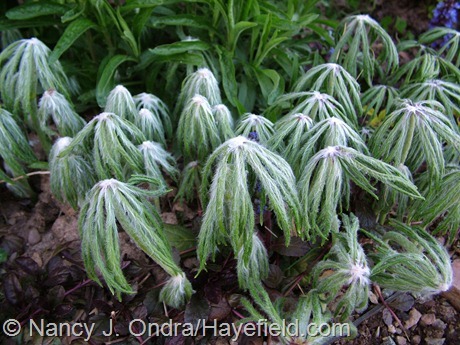 Our peonies have tiny buds but are just beginning to leaf out — at least 2-3 weeks away from blooming, but you are just enough south of us to make a huge difference. 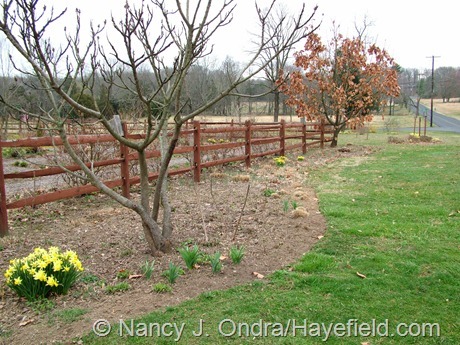 I love wandering through the pictures of your wonderful treasures and look forward to your monthly posts this gardening season. You are such an inspiration for me and Steve! Hey, Cathy – thanks for stopping by. So sorry to hear about your magnolia. We’re flirting with frost yet again here, but at least we’ve finally had a soaking rain – perfect planting weather. I hope you both have a great spring! 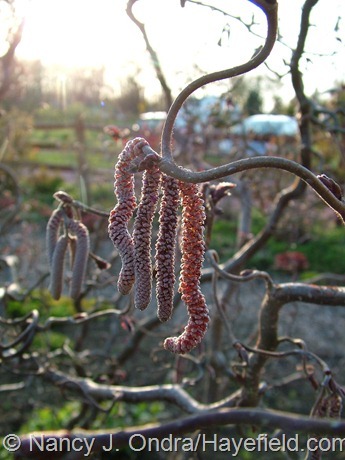 How do you feel about the ‘Red Majestic’ hazel? I have a small yard. Is it worth giving it the space? 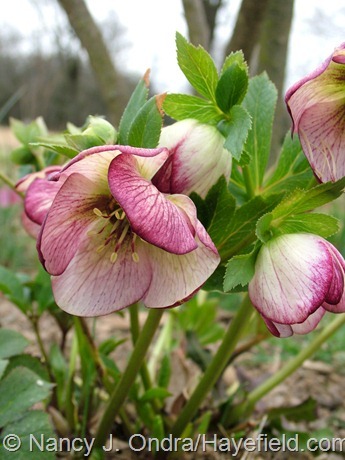 I like it very much, Melanie: fantastic winter interest from the stems and catkins, and exceptional deep purple color in spring and early summer. It *is* kind of boring from midsummer through early fall, once the leaves have turned green; the fall color is not wow, but it’s okay. If I had space for only one shrub, would it be ‘Red Majestic’? Yes, I think it might be. Do try to find an own-root one, if you decide to try ‘Red Majestic’ for yourself, so you don’t give yourself a lifetime job of cutting out straight-stemmed suckers. Wonderful as usual Nan! I think I am kind of in love with that Poncirus. 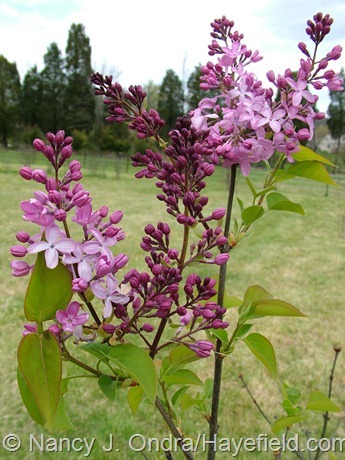 There seems to be a good deal of discrepancy with regards to the hardiness listing of this shrub though. Some sites say it is hardy down to z5, while others list it as being good only to z7. What are your thoughts on that? Not that I actually have enough room in my garden for another large shrub, lol. But I am curious anyhow…. Hi Christin! Thanks for checking in. I’m in mid-Zone 6, and there’s absolutely no hardiness problem here the straight species of hardy orange or with ‘Flying Dragon’. It definitely does need ample space, though, because you don’t want to have it anywhere near a path (those thorns are *wicked*); you also won’t want to have to prune it frequently to control the size (for the same reason). I can only imagine how long your “to-plant” list is, Kim. You’re going to go wild with a bigger space!